I watch the Food Network a LOT. If I’m not watching reruns of The Big Bang Theory or Criminal Minds, I’m watching the Food Network. When I’m watching the Food Network, I’m most likely also searching for and pinning recipes on Pinterest. There are a few ingredients that I’ve been dying to try (thanks to being taunted by the Food Network). A couple of those are prosciutto and pancetta. They’re both pork products, and who doesn’t love pork? Last weekend I finally gave in and bought a package of prosciutto. I didn’t like the price, but I really wanted to try it. So I have prosciutto. Now what? Pinterest was showing me pairings of cantaloupe and prosciutto, but I didn’t want to pay $4 for a cantaloupe. 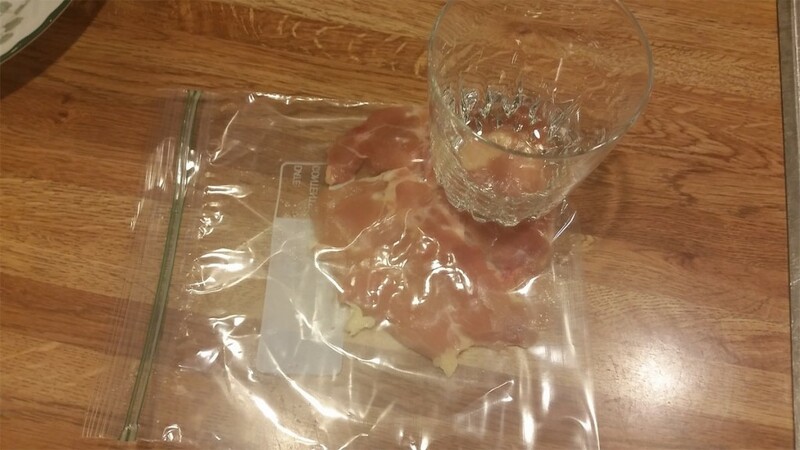 I also found a lot of recipes pairing the prosciutto with chicken. None of the recipes I found really made my mouth water, so I decided to make one up myself. I decided to stick with chicken. Earlier this year, I had a panini that had pesto on it, and I fell in love with pesto. I just so happened to have a container of it in my fridge, so I added that to the list of ingredients. 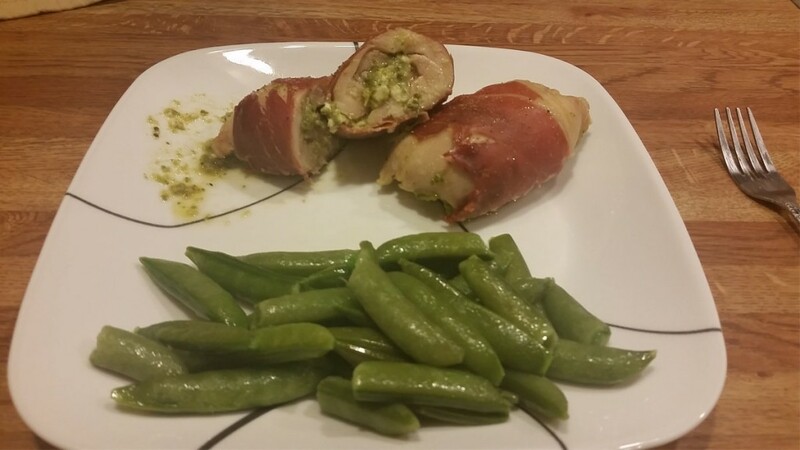 Chicken, prosciutto, pesto … what about CHEESE? Mozzarella would have been a good choice, but I wanted something different. I happen to LOVE feta cheese, and I just so happened to have a container of that in my fridge. All set. Now I just needed to gather, assemble, cook, and enjoy. I liked out it turned out, so I thought I would share. 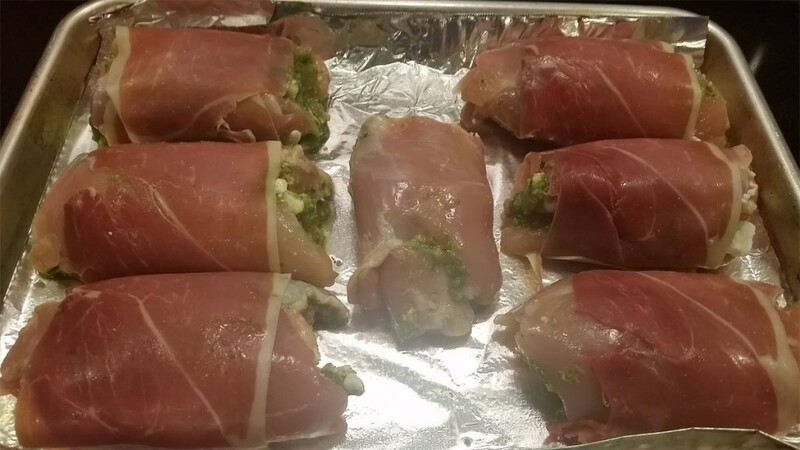 The cast of characters … chicken thighs, feta cheese, pesto, and prosciutto. 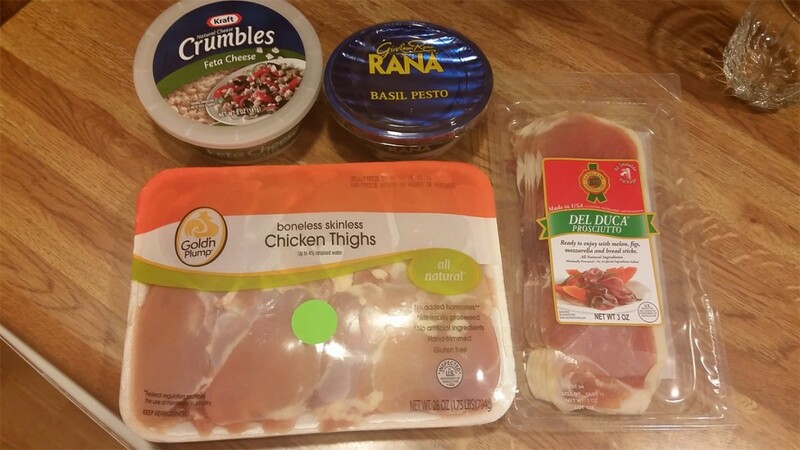 You could replace the chicken thighs with chicken breast, but I had a few packages of boneless chicken thighs in my freezer from one of the meat sales at CashWise. 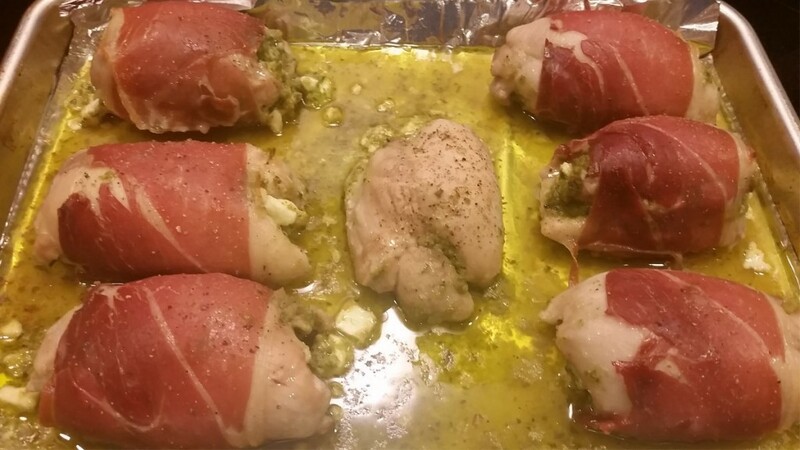 Step #2 … spread a couple spoonfuls of pesto over the flattened chicken. Use as much or as little pesto as you want. I happen to like pesto, so I used a couple good sized spoonfuls. I used almost an entire 7oz container with 7 chicken thighs. 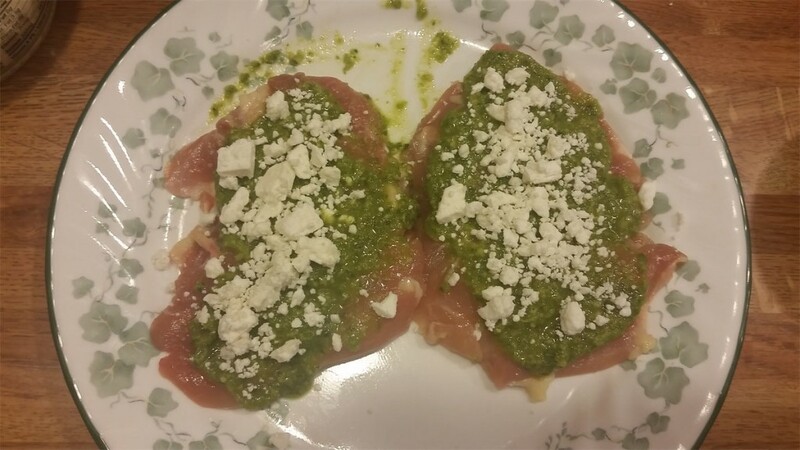 You could probably season the chicken before spreading the pesto, but I completely forgot to do that. But the pesto has a lot of flavor, so I don’t mind that I forgot. Step #3 … sprinkle the feta cheese on top of the pesto. Again, use as much or as little feta as you like. Try not to go too overboard … you still have to roll up the chicken. Step #6 … bake at 375° for 30 minutes or until the internal temperature is 165° or so. Step #7 … take the chicken out of the oven, cover it with foil, and let it sit for 5 minutes or so while you finish up your side dishes. Step #8 … enjoy with your favorite side dish. I had a package of sugar snap peas in my freezer, so I cooked those up. Some potatoes would have been tasty as well. Flatten the chicken to an even thickness that will make it easy to roll up. 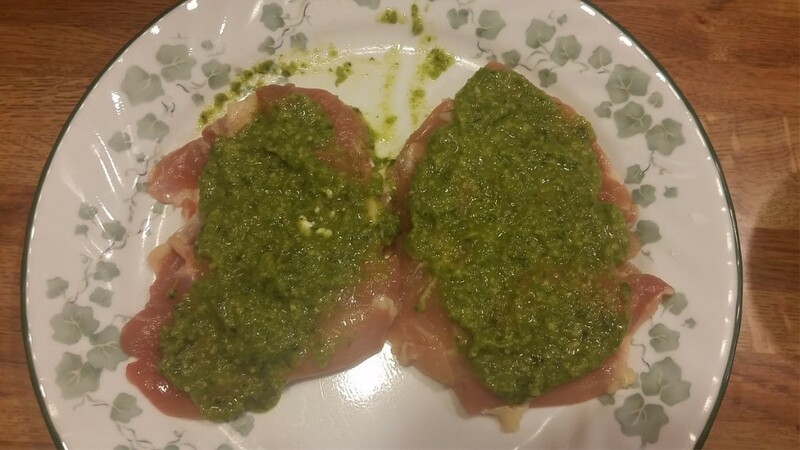 Spread pesto on the flattened chicken. Sprinkle feta cheese over the pesto. Roll up the chicken. Some of the pesto and cheese will most likely fall out, so just stuff it back in. 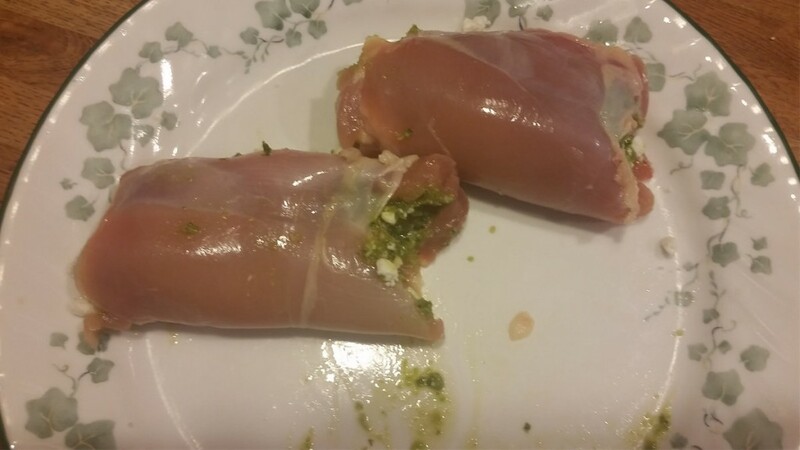 Wrap the rolled up chicken with a piece of prosciutto. Place the chicken rolls on a baking sheet and bake at 375° for 30 minutes or until the internal temperature is 165° or so. Take the chicken out of the oven, cover it with foil, and let it rest for 5 minutes. Enjoy with your favorite side dish.